Imagine that you are in charge of making decisions for a major publisher. A writer presents you with a new novel based on the following story: A very young (49-year-old) President of the United States is elected and quickly stalked by a madman. The president serves only 6 months before he is shot by this crazy person. As the shooting takes place, one of the men standing alongside the president has been present at three presidential assassinations (although he is in no way connected to the assassins). The physician in charge of saving the president cannot locate the bullet in the president’s body, and turns to a world-famous inventor for his assistance in creating a new machine that will find it. Despite their best efforts, the president does not survive and the vice-president – a political hack who is against everything the former president stood for – assumes office. This new leader throws aside his former supporters, and proceeds to fully implement the dead president’s political agenda. No doubt you would reject this fictional tale as being beyond the bounds of believability. And you might be right, except for the fact that this all, in fact, occurred in 1880. 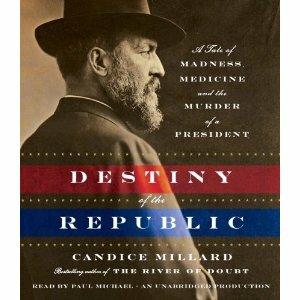 As documented in The Destiny of the Republic, one truly fascinating account of the events surrounding the assassination of President James A. Garfield, and the assumption of the high office by Chester A. Arthur, these events happened. The genius inventor who attempted to save the life of the president (in the days before x-rays) was Alexander Graham Bell. The witness to Garfield’s assassination was Robert Todd Lincoln, “…the only man to be present at three of our nation’s four presidential assassinations.” And President Arthur, a product of the New York State spoils (political patronage) sytem, was to be the man who enacted civil service reform. Arthur came to be known as the Father of Civil Service, a title that would likely have been Garfield’s, had he survived being shot. This is a detailed and moving version of the events surrounding the life and death of James Garfield of Ohio, a man who was very much in love with his wife; a woman who nearly preceded him in death. Garfield was to die, not from the bullet that lay harmlessly encased in body fat within his frame, but from medical malpractice and incompetence. In modern times Garfield, like President Reagan, would have survived his injuries and returned to the White House. This true story is very cinematic in nature and might well make for an excellent film filled with multiple larger-than-life characters. Thanks to Candice Millard, it is a story that will not longer be a blip in the history of the United States. If you know of a young person who is interested in reading about the history of our country, consider presenting this book to him or her as a very valuable present. If doctors are the mortal gods of medicine, then nurses are its angels. 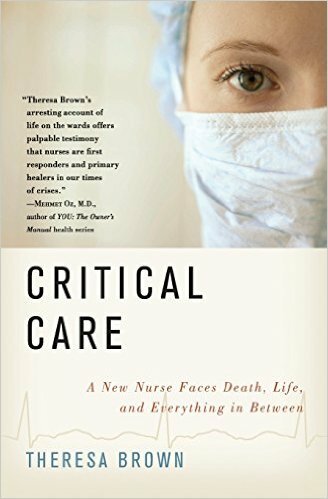 At least that’s the case put forth here by Theresa Brown, a former Tufts University Journalism professor turned Registered Nurse (R.N.). Still, this seemed like a somewhat lightweight survey of a crucial field. There are some specific problems with the telling. Brown shows us her empathy in writing about patients like the all-too-young David, who is battling leukemia; and Irene, the Pittsburg television personality who does not realize that she’s dying until she hears her former co-workers talking about her on TV. But as soon as we become engaged with their lives, Brown’s off describing other things – like a voluntary job change. Brown also loses track of former patients (some of whom have likely died) and their families. In this age of the Internet, it’s odd that she did not pursue some basic research to find out what happened to them. Also, the book begins with multiple pages of acknowledgments which seems distracting before we get to the actual content. A last flaw is that we do not get to know the author’s husband or daughter. They remain on the edges of the stage. What Brown does quite well is to convince the reader of the need to enjoy life (and other people) while good health lasts. Today’s tiredness may be diagnosed as leukemia or some other energy-robbing disease tomorrow. Critical Care lets you walk in the shoes of some very ill patients, both young and old. Yet for a better overview of today’s world of medicine – as practiced on a daily basis – I recommend two books by Dr. Atul Gawande. The most recent is Better: A Surgeon’s Notes on Performance (2008). The contemporary classic is Complications: A Surgeon’s Notes on an Imperfect Science (2003).